Over the past six weeks TTL’s Outreach team has been partnering with thirty-six Village Health Workers (VHWs) to hold site visits in the Libibing area of Mokhotlong district. At site visits, Outreach staff work alongside community-appointed VHWs to assess the health of children from a few specific rural villages. In many cases, these villages never see service providers but rather community members must travel long-distances by foot to reach an under-staffed and under-resourced rural clinic. Outreach workers coach VHWs to measure children’s height and middle-upper arm circumference, along with weight, to get a more comprehensive assessment of a child’s nutritional status. Alongside the training session, these site visits present an important opportunity to identify any children who require TTL’s support. Following the site visits VHWs will be able to continue to make referrals to TTL, working as our ‘eyes and ears’ on the ground. 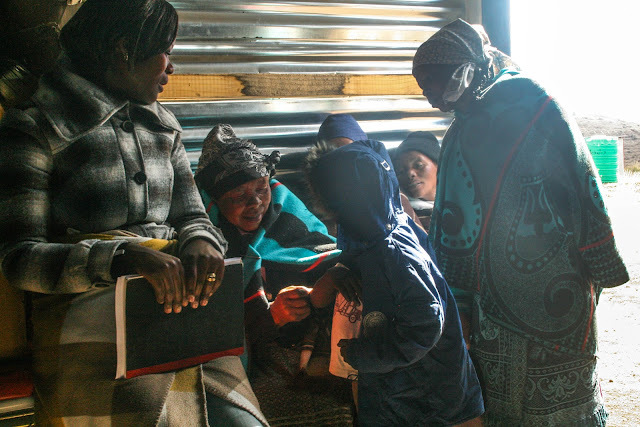 The results of these recent site visits have strongly illustrated the challenges Basotho families are currently facing in light of Lesotho’s food crisis. At one single site visit, representing three VHWs' communities, eleven babies were so malnourished that they required TTL’s support. Luckily, none of these children presented symptoms deemed critical enough to require them to come to the safe-home. Rather, through the Outreach Program’s support, TTL will work to get them back on track while they remain at home with their caregivers. Yesterday’s site visit was different, one new child has been brought to the safe-home. This baby girl looks only a few months old – smaller than even our small safe-home eight month old babies – but her Bukana says she’s 14 months. There’s not a millimeter of baby fat under all those of layers of clothing, this little one weighs only 5.3­ kg. Without the Village Health Worker network, TTL may never have learned about this child, or the eleven who have recently joined the Outreach program. Or, we may have heard about them in a few months time when they were much more critical and getting them back on track towards recovery would be an even greater struggle. This is the strength of the Village Health Worker Program. More ‘eyes and ears’ on the ground and earlier identification means more vulnerable babies will receive the assistance they need so they not only survive but can eventually thrive within their own communities.